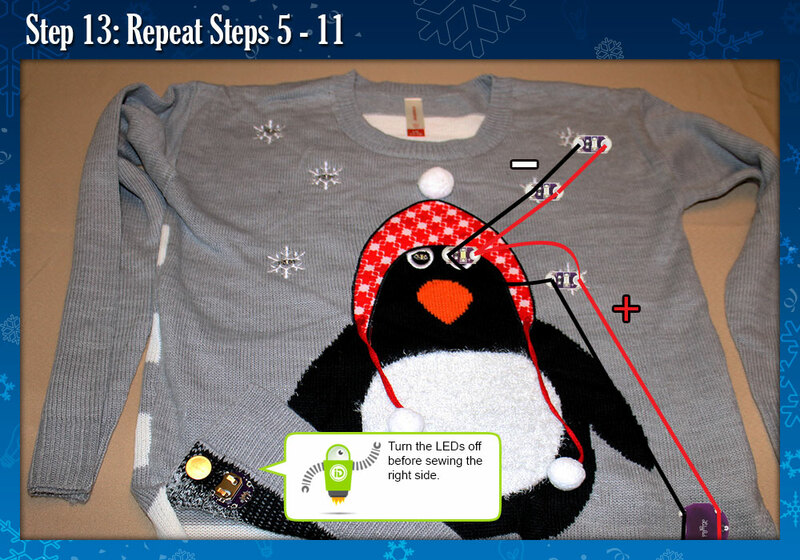 Brighten your holiday with a light-up sweater! This DIY project uses LilyPad Arduino components from our Engineer Shop course which is available this summer at Alexa Café, our all-girls summer program for ages 10-15. 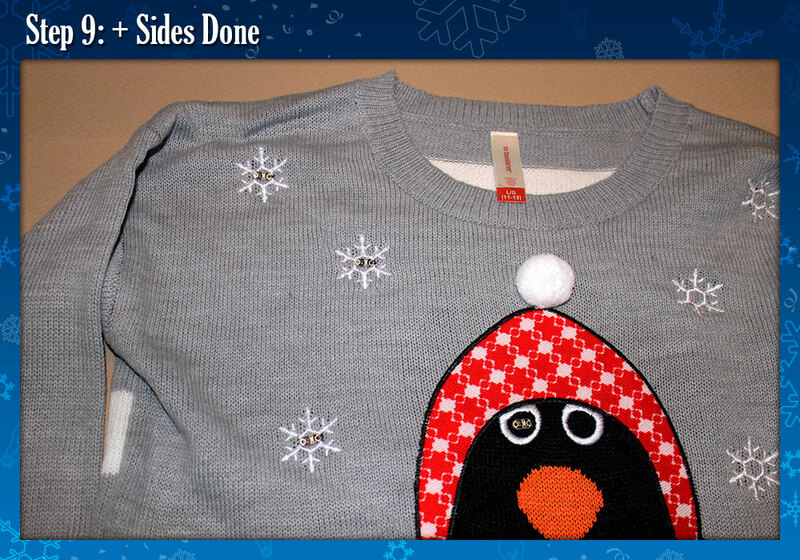 1 x Holiday Sweater - The sweater we used was make made by No Bounderies and purchased at the local Walmart. It is not available in their online store. It's important to first decide how many LEDs you will need and where they should be placed. 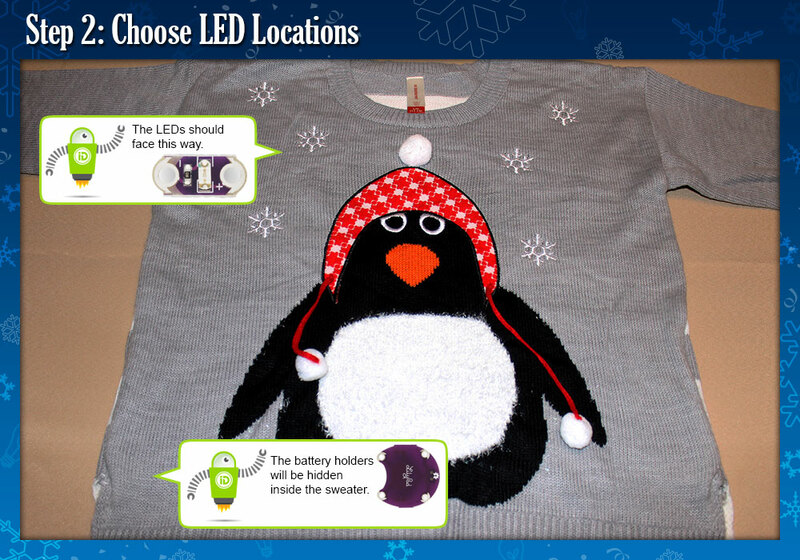 Use the below guide if you decide to use a different color or quantity of LED for your sweater. Different color LEDs have different power requirements so if you use certain color LEDs, you will have to use less per battery. White LEDs - Up to 5 per battery holder. Blue, green, purple, or yellow LEDs - Up to 4 per battery holder. Red LED - This uses a lot of power so your battery holder should only power one LED. First you are going to decide where the LEDs and battery holders will be placed. 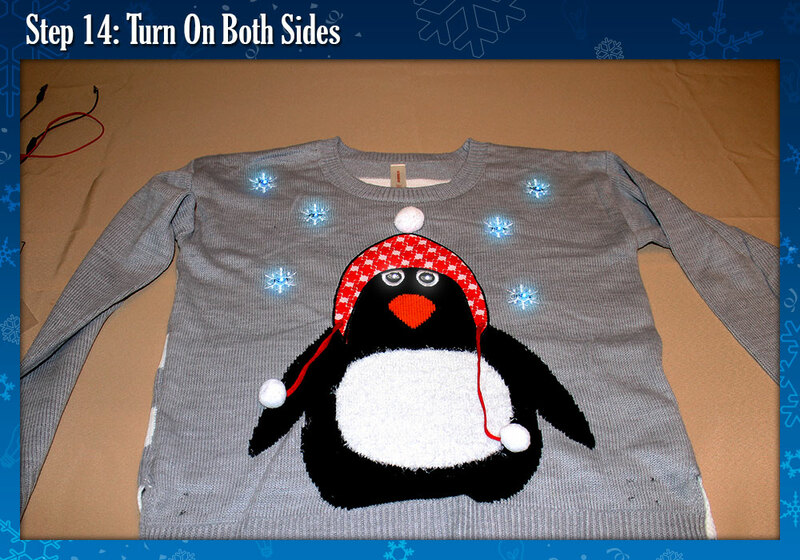 For this sweater, the snowflakes will be blue and the eyes will shine white. 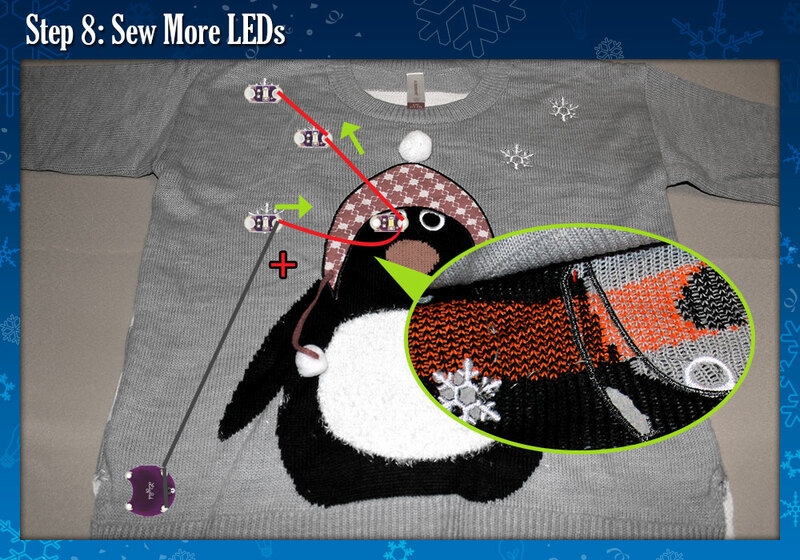 To see if you have enough material, lay down the battery holder and LEDs on the sweater with the - of the battery holder and LEDs pointing to the left. Here is the path you will be sewing. 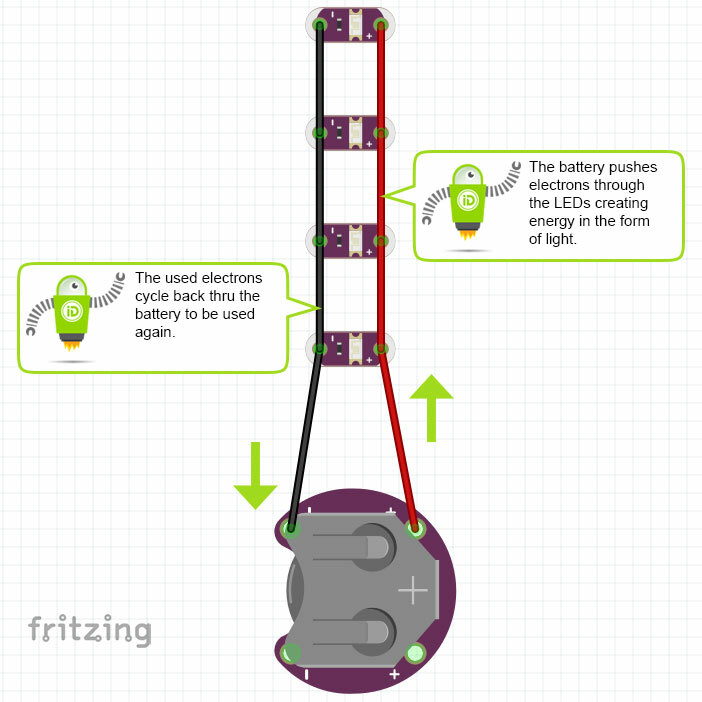 Notice how each battery holder powers 4 LEDs each? You will be sewing the + side of the battery holder up to the + sides of the LEDs. Then you will sew the - side of the battery holder to the - side of the LEDs. The hardware will be sewn in this order: battery holder, blue LED, whtie LED, blue LED, blue LED. Let's look at this diagram to see how it works. This is called a parallel connection; it distributes power evenly to each LED. 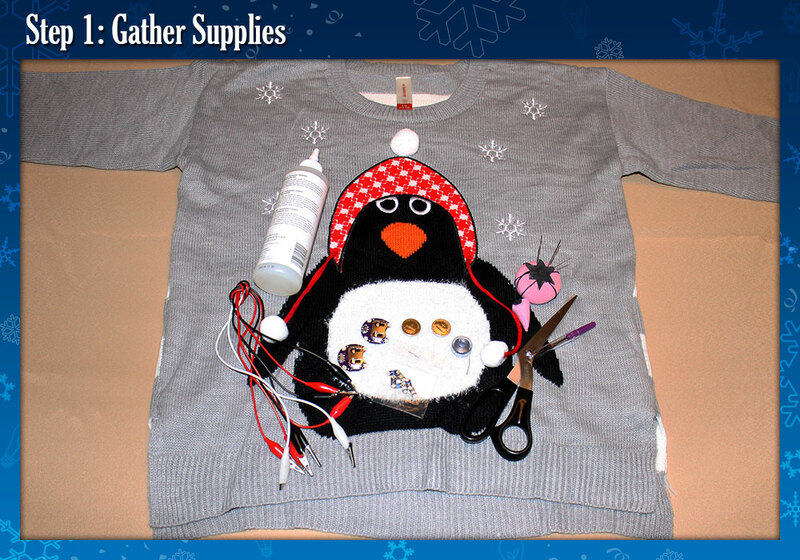 No matter what type of sweater design you are creating, this is the layout you will use. Notice in Step 3, there are 2 parallel connections in a zigzag pattern? 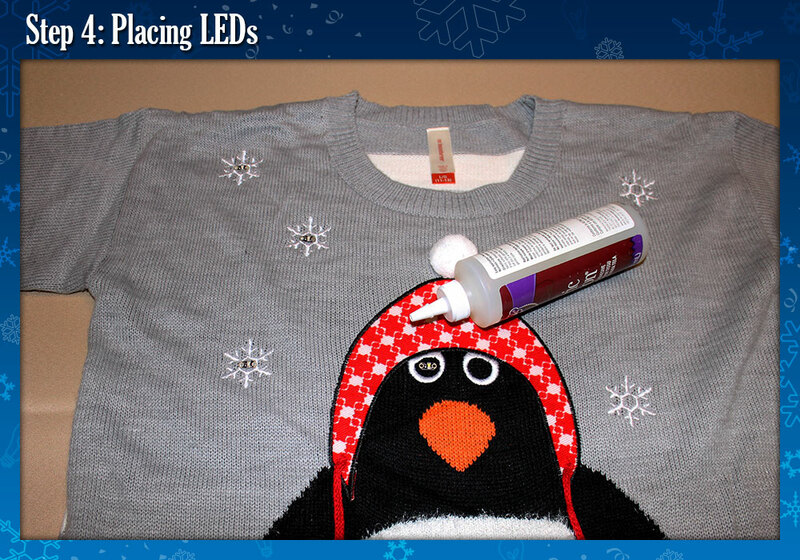 While you are placing your LEDs, you could use a little bit of fabric glue to hold them in place. 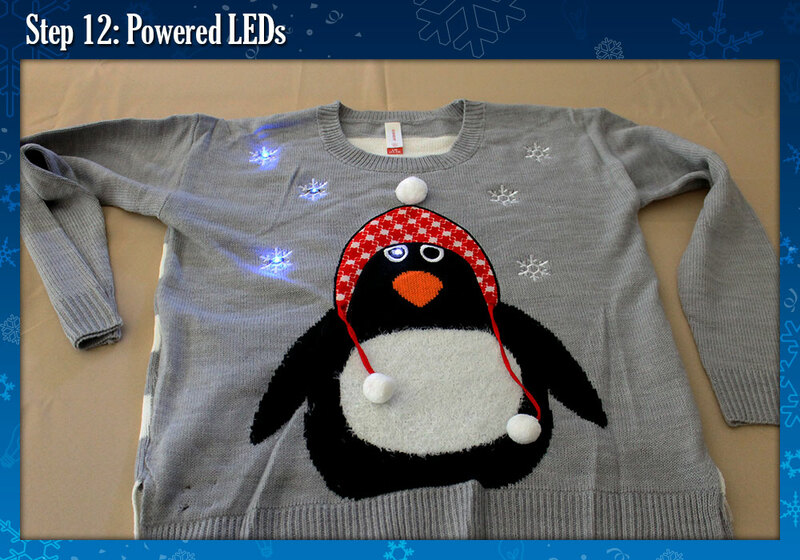 If your sweater is really fuzzy, the LEDs will not stick. Make sure one last time that the battery holders and LEDs are facing with the - side on the left and the + side on the right. 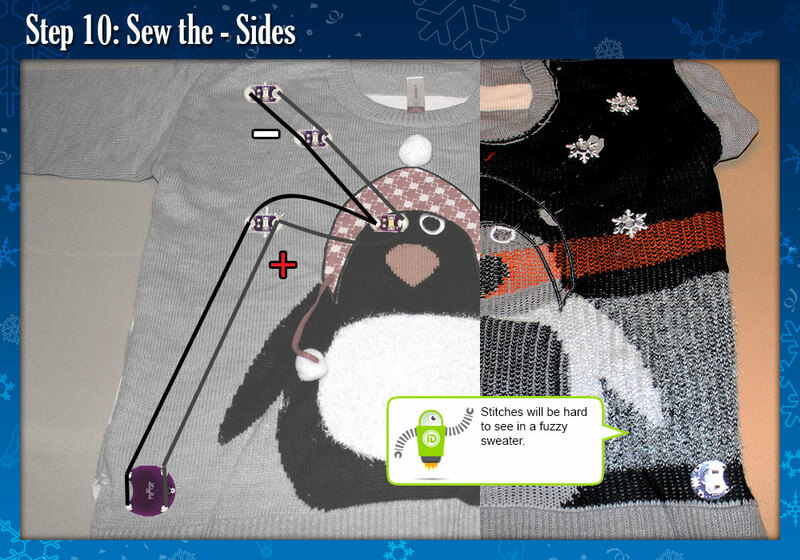 If the glue does not stick, just set the hardware to the side; you could even draw a sketch of the sweater and lay the hardware in the correct positions as a reference. To sew, start with the + side of the battery holder. You are going to place it inside the sweater so it's hidden. See the explanation below if you have trouble threading the needle. Make sure to sew from the bottom + to the top + of the battery holder so it's held down. Whenever you run the thread thru the + or - hold of the battery holder (and LEDs) loop the thread at least 3 times. This will ensure you have a strong connection. Once you have sewn both + sides of the battery holder, start sewing up to the + side of the LED. So, how does this thread make LEDs light up? It's conductive! It is made from stainless steel fiber woven together so you can sew your electronics together without needing lots of wire! Take the thread end from your bobbin (the little circle that holds the thread). Push the end of the thread thru the eye of the needle. Pull the thread thru about 3 feet. Cur the other end and center the needle on the thread. When you tie the ends, the thread should be around 18 inches. Make a simple loop knot. Cut off any excess thread at the end of the knot. You're going to sew with the sweater inside out to hide the stitches but if this is your first time sewing, you can sew on the outside if that's easier. If you have a really fuzzy sweater, go ahead and sew on the outside, the thread will be hidden. 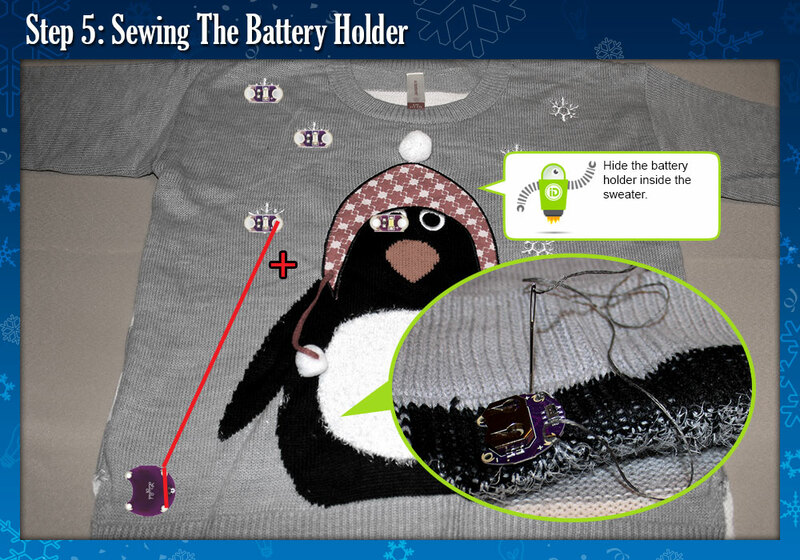 The thread is grey and half the sweater is grey so the thread is going to be a little hard to see, but in this example, a straight line has been sewn from the + sides of the battery holder to the + sides of the first blue LED on the bottom right snowflake. Make sure to loop the thread thru the + side of the LED so the connection is strong. 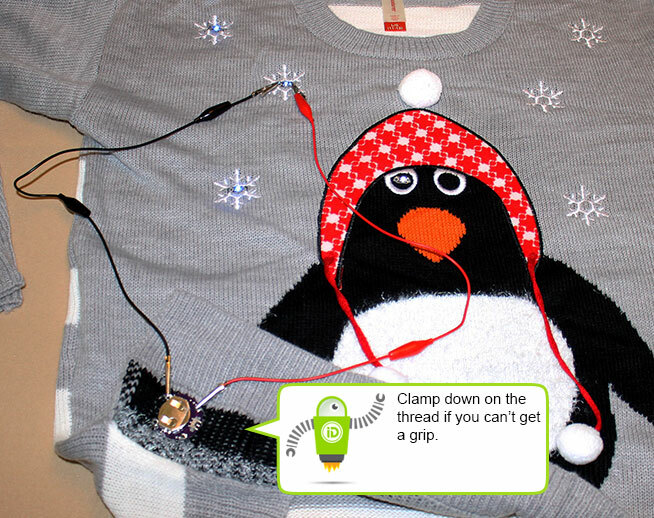 You will need to hold the sweater open to get to the LED. When you are stitching, don't pull the thread too tight or the sweater will bunch up. If you keep the sweater straight while sewing, then you should be able to stitch without leaving the thread too loose or right. Let's take a quick look at your work. You should have the + side of the battery stitched up to the + side of the blue LED only. If the LEDs did not stick with the glue, that's okay. Just set them aside until you need them. 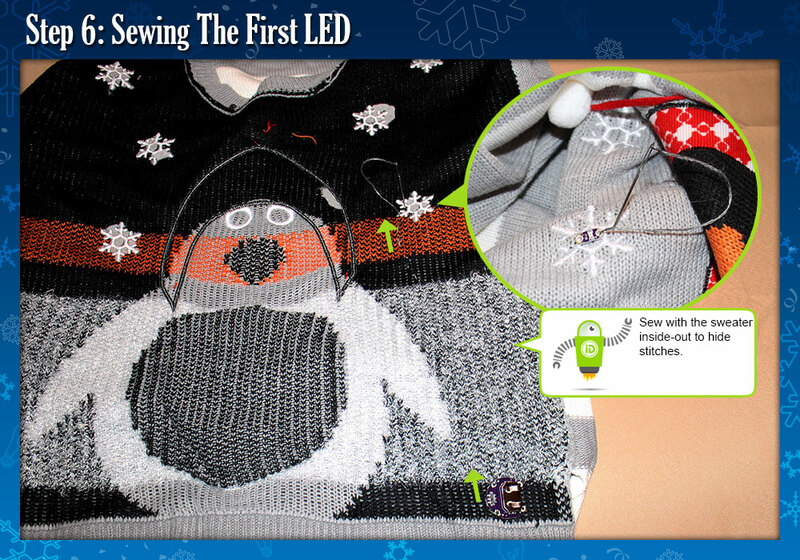 Make sure the LED is stitched firmly in place and the sweater is not bunching. Now you will repeat Step 6 again for the other LEDs. First stitch the + side of the blue LED to the white LED in the penguins left eye. From there, stitch from the + side of the white LED, and work your way up to the next two blue LEDs. If you don't have enough thread to make it to another LED, tie off and cut the thread there, then start a new thread. Just loop the new thread 3 times around that same LED (there should now be 6 loops in the + side of the LED) and then continue on your course. Time to check your work again. Make sure only the + sides of the LEDs are sewn down. If you accidentally attached a - side, just remove it with either scissors or a seam ripper and then re-sew the connection. Now that you have completed the + side. Let's finish the connection by sewing down the - sides. 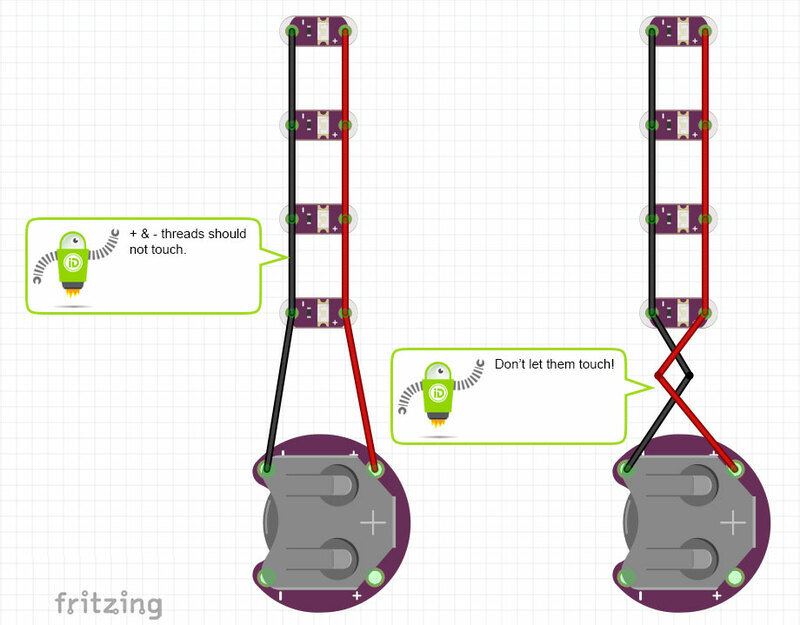 Just start with the battery holder and follow the same path as before (reference steps 5 - 9). Make sure none of the thread from the - side touches the thread from the + side. This drains power and creates a short circuit. Electricity follows the path of least resistance. If the threads touch (see the example on the right), some of the power will flow back to the battery before reaching the LEDs. If your LEDs end up being really dim, this could be the cause. 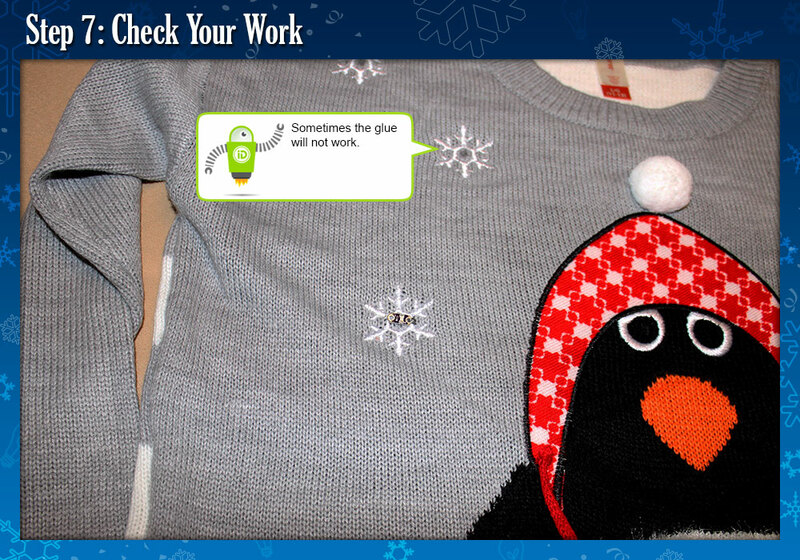 Check your work again and make sure everything is attached properly. 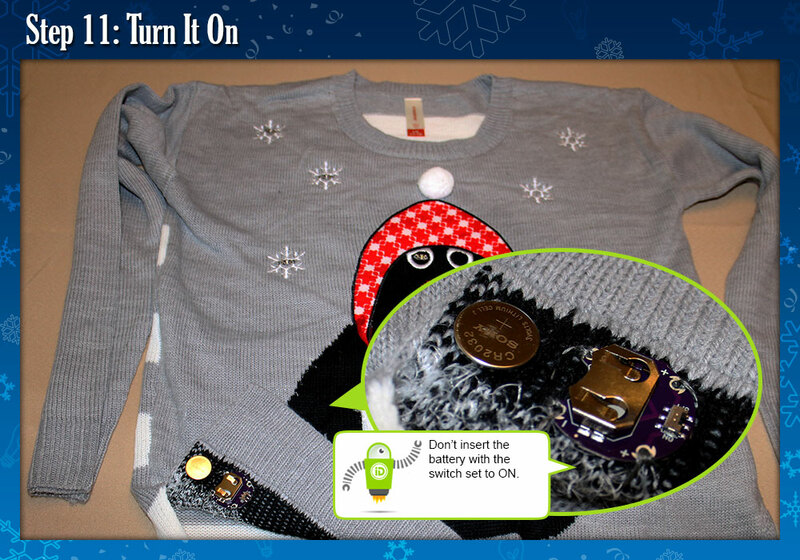 Before turning the LEDs on, make sure the sweater is not bunched up anywhere. Never turn the sweater on unless it is laying flat or you are wearing it so the threads don't touch. When you are ready, place a battery in the battery holder and turn it on. You have finished the first half of the sweater! Notice how the battery holder is hidden except for a few stitches? The battery could be upside down. Make sure the + is facing up. Check if the battery is dead. Try another battery. Is only the bottom LED lighting up? Check the top LED to see if it is connected properly. Here is where the alligator clips come in handy. If you are not sure why a LED is not working, take the alligator clips and attach one to the + and - sides of the battery holder. Now touch the open ends of the alligator clips the corresponding sides of the LED. If the LED lights up, then the connection was weak. You may need to re-sew that LED to strengthen the connection. If the LED stays dark, it maybe burned out or defective; you will need to remove or replace it. To sew the right side of the sweater, just repeat steps 5 - 11. 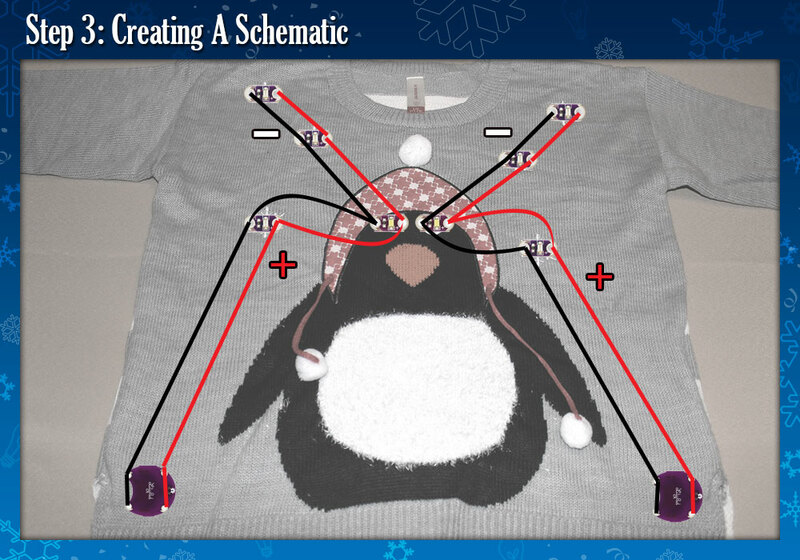 You now have a light up holiday sweater!